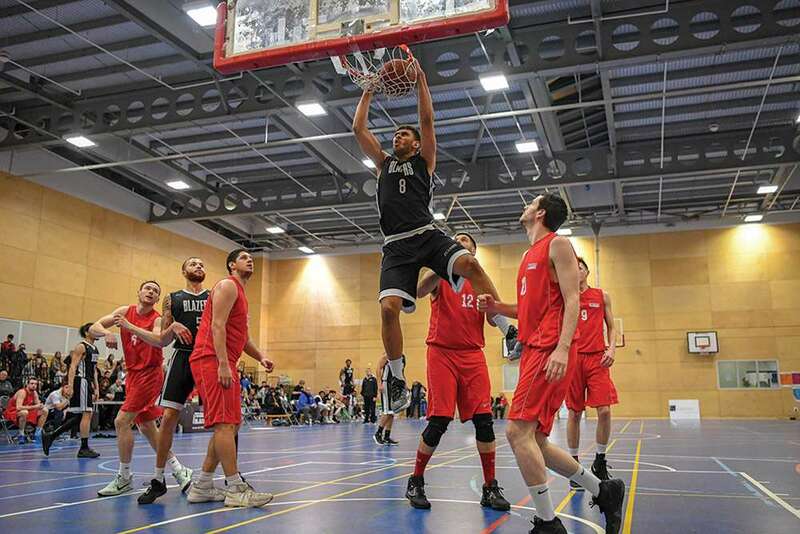 After conceding 25 points in the first quarter, Derby Trailblazers held Team Newcastle to just 31 more in the remainder of the game, to complete a 76-58 home win in front of a large and vociferous crowd at the Clarence Wiggins Sports Centre. The Trailblazers forced the visitors into 26 turnovers, five of them coming in the form of shot clock violations, as Derby tightened their defense to a level not previously produced this season. By simply taking advantage of Newcastle’s turnovers, they profited to the tune of 27 points, which makes winning any game so much easier. Matt Ward-Hibbert led the Trailblazers efforts with 21 points, Malcolm Smith and Isa Brandon added 18 each and Oli Stanley finished with nine points. Kayne King and Charlie Brown controlled the back court well, dishing off five and four assists respectively, while Smith, Stanley, Brandon and Wilford led the team in terms of rebounding. “It was nice to finally get a home win and also to produce a good home performance. After the first six minutes where we weren’t that great and they shot the ball well, I thought we defended very well and made them really earn any points they got. “The press in the second half caused them problems; we forced them into a lot of turnovers including several shot clock violations. The press also seemed to give us energy and helped us on the offensive end too,” he said. Having won the tip, Derby opened the scoring as Stanley converted one of two shots from the line, but after Newcastle responded with a lay-up from Seipt, it was the visitors who would lead for the remainder of the first half and deep into the third quarter. Inside and outside scores from Nikola Urli stretched their advantage to 7-1 after less than two minutes, before Smith finally scored Derby’s first field goal. Urli then scored a triple and a lay-up either side of a jump-shot from Smith, before Benson Arogbo cut the gap to 12-7 with a big dunk. Consecutive three-pointers from Eric Stafford quickly stretched Newcastle’s advantage to 18-7 by the mid-point of the first quarter and it was beginning to look as if Derby could be in for a very long and difficult night. However, a step up in defensive prowess by the Blazers radically changed the way the game progressed over the next thirty-five minutes. A turnaround jump shot from Smith was followed with outside and inside scores from Ward-Hibbert, as Derby pulled it back to a four point game and after a series of baskets were exchanged, it was only a three-pointer from Mark Elderkin which meant Newcastle led 25-18 at the first break. Newcastle’s lead peaked at 33-24 midway through the second, before the Blazers slowly began to get their offense working with some kind of fluidity. Isa Brandon’s first home points came in the form of a three-pointer which trimmed the gap to five points. Then, after a spell in which neither side could find the hoop, consecutive scores from Ward-Hibbert and Wilford pulled it back to a one point game, before Frank Urli made it 35-34 at half time. It wasn’t until the seventh minute of the third quarter that Derby finally took the lead, as consecutive three-pointers from Brandon and Ward-Hibbert put the Blazers 46-45 ahead and Newcastle’s heads visibly dropped. Gone was any kind of belief that they could win the game and meantime, the Trailblazers realised the game was there for the taking. Newcastle briefly tied the scores at 50-all, but Derby’s response a 24-6 run which was concluded with a monstrous two handed dunk by Stanley off an assist from Brandon. The final twelve points in the run came without reply as Newcastle were held scoreless for almost five minutes. “I though Isa had a fine home debut and I’m sure the home fans will be excited by the way he played. Matt had a great game too, making some tough shots particularly when we made our run in the second half. “Charlie came in and gave some very strong minutes and I thought he controlled the game well from the point when he was on the court and made a huge contribution. “It was a team win overall though and in the last thirty-four minutes we only gave up forty points. I felt defensively we were tuned in and we continued to do well, regardless of which five guys were on the floor,” he said. Derby: Ward-Hibbert 21, Brandon 18, Smith 18, Stanley 9, Wilford 4, Arogbo 2, King 2, Brown 2, Bowman 0, Mutemesango 0, Ptak 0, Lue DNP. Newcastle: N. Urli 15, Stafford 11, Nzerem 7, Elderkin 5, Owen 5, Evbuomwan 4, F. Urli 4, Wol 4, Seipt 3, Fuentes 0.